A while back, I reviewed a fabulous cookbook called The Great American Slow Cooker Book. One of the things I loved about that cookbook was that they had directions for three different (common) sizes of slow cookers. 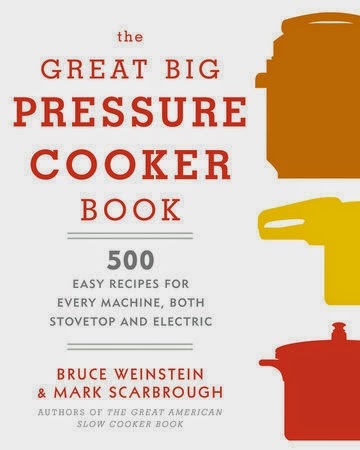 When I saw there was a new title available, The Great Big Pressure Cooker Book, I jumped on it. Too quickly, I'm afraid. My thought process was that I own three pressure canners or cookers, I've never used them to cook, really, so this would be perfect. Once the book arrived, I realized that this book assumes that you have a 6 quart pressure cooker (though a 5.5 quart will work too), either electric or stovetop. My devices are all either WAY too large for what they are proposing, or far too small. So I set about just reading through the book so I could write a review. In the process, I decided I needed a new pressure cooker. Fortunately, I had some money available from some wonderful birthday presents, and I got a really nice electric one. I'm thrilled. rates each recipe by the amount of effort required. Love that. The labels are common sense ones. "Not Much" for a recipe like Turkey Sausage and Macaroni Casserole, where you brown the veggies and the meat in the cooker, then add ingredients, pressure cook, add a few more ingredients and let it sit. "A Little" for a recipe like Pork Tenderloin with Black Beans and Coconut Rice, where you brown the meat, remove and add some veggies and cook til softened, add spices and cook, stir in a bunch of ingredients and stir until dissolved, add meat back, pressure cook, and serve. Or "A Lot" for a recipe like Stuffed Flank Steak with Bacon and Pickles, which has a whole lot of steps but it sure sounds amazing. uses mostly normal types of ingredients. Not necessarily things I keep on hand, but things that I at least have heard of. has a "Testers' Notes" section for each recipe that is simply fabulous. Like the Maple Dijon Wings recipe, where the notes tell you not to use anything but real maple syrup, and they give suggestions for if you prefer a thinner sauce. Each recipe includes instructions for both a stovetop pressure cooker and an electric one. Some recipes include serving suggestions, like the Salsa-Braised Chicken Leg Quarter recipe, which suggests a rice/bean mix that you use as a bed for the chicken and sauce. I haven't prepared many of the recipes yet, but the ones I have tried have worked out great (aside from my learning curve in figuring out my new cooker!) It is amazing how quickly rice cooks, for instance, and I am loving that. 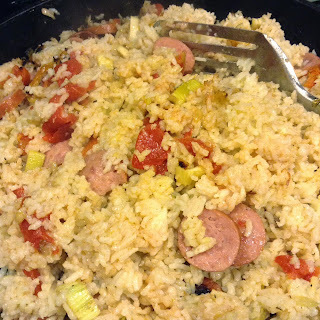 Just the other night, I used the pressure cooker to cook up rice (using instructions in the book), and used that to make jambalaya. It was by far the best jambalaya I've ever made, and one big part of that was that the rice was actually cooked. One thing I noticed is that these recipes frequently call for fresh herbs. That isn't something I've traditionally had available to me, but I am growing some now so that should make those more possible. I don't love this cookbook nearly as much as I did The Great American Slow Cooker Book, but it is still a pretty fantastic collection of recipes -- 500 of them! -- and I am glad I own it.